It’s been a busy week at Satis House, as you can probably tell given that I haven’t posted anything since Monday. I guess it’s really been a busy week away from Satis House–an evening appointment, a couple outings with friends, a special church meeting, etc. But, I did manage to work on the ever-looming mountain of yard waste that I keep referring to and which still lives in my backyard (I’m starting to understand how the Dad from Better Off Dead felt about Lane’s Camaro that lived in a cocoon in his front yard until he and Monique finally fixed it up…). Ok so the perspective from which I took this picture does kind of falsely exaggerate how big the pile is, but I still like how tiny it makes the chipper look. I mean, no complaints about the chipper–it is a Troy-Bilt, which is a quality brand, and I’m getting to use it for free, after all–but it’s definitely a “home”-size version. Once I charted shoving the sticks in, I realized that I need an industrial-sized chipper if I’m ever going to see my lawn again. At one point, I watched an episode of “Ask This Old House” (which, PS, is totally my new favorite show on PBS, followed closely by the original “This Old House”). Roger (the garden/landscape expert and my favorite character) was helping a young woman do essentially what I’m trying to do, which is unveil her lovely house by cutting back and digging out several enormous shrubs. He did the chainsaw work (like my friend Alex did for me), and her job was to drag the branches away and FEED THEM INTO THE INDUSTRIAL-SIZED CHIPPER(!!!) they had parked on the curb. OMG, I totally wish I had rented that sucker and done the same thing–just instantly shredded everything as it was being cut so it didn’t accumulate into such a mass/mess. Alas, I didn’t shred-as-I-go/went, so now I’m playing catch-up. So after about 45 minutes of tossing in the sticks and trying not to pull a Fargo (although at one point I did trip over some vines and my head landed next to the chipper, which was a *li’l* bit too close for comfort and left a huge bruise on my hip), the thing got jammed and/or ran out of gas and turned itself off. Frankly, I was ready to be done, so I was okay with it. 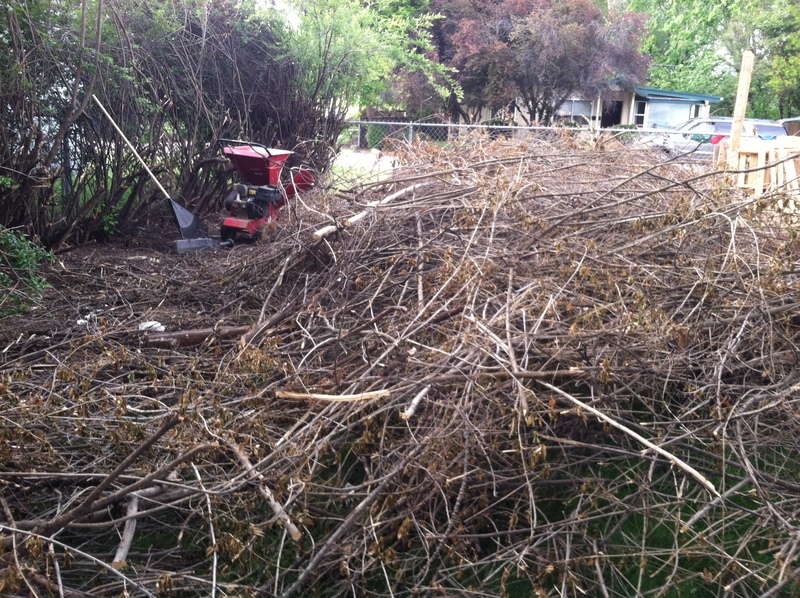 And it was at that point that I accepted defeat: yard waste-1, me-0. 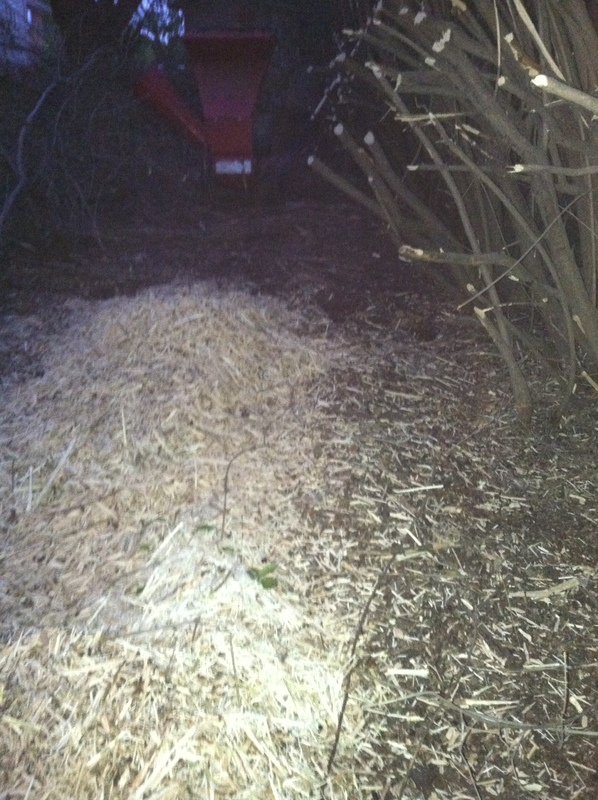 At least I have a little bit of mulch to show for my work. If I only had a rabbit cage or a hamster, I could use it for bedding… It was a nice evening, though, and I give myself an A for effort. There is something so satisfying about doing physical labor, wearing my carhartts and getting all sweaty and dirty outside after a day of listening, reflecting, and meditating for my day job. And, there was a beautiful thunder and lightning storm that blew through town just as my work was wrapping up (that’s why the pictures are kind of dark). Being that I am the lady who loved lightning (five points for anyone who gets that literary reference), I enjoyed sitting on one of my stumps, breathing in the fresh air and watching the black clouds and lightning bolts storm on by. My handiwork for the night.